Oh yes, according to the pattern, this here is a Ladybug. As the last project of the day, I had to have another go at it because I had trouble with it the other morning and that ... bugged me! After two days of reading crochet patterns, surely I'll be able to do this. Well, what I was doing wrong had nothing at all to do with the different crochet languages. Like almost all patterns I've read so far, this one is English. After the reading of the last two days, when I came back to this one I found it was very simple, just a small round ball really. What gave me the problem was I thought the "sc 3" in "sc 2, sc 2 in 1, (sc 3, sc 2 in 1)" meant "three single crochet on one hole" which of course is wrong and was why I ended up with a hyperbolic shape. I don't know why, but after reading crochet patterns for two days, when I came back to this I saw it simply as "single crochet three stitches each in its own space" lol. It's good to know my feverish production of small crochet projects over the last two days has helped my poor reading skills to improve. The pattern called for glueing, felting and attaching, but I did none of that. I simply chain stitched the attennae as part of the chain stitch that goes over the top between the two colours, and used embroidery stitches for the eyes, dots and fine line at the back. A very simple project I'm unlikely to do again unless someone requests it as its a bit fiddly, fussy and not a particularly useful object. It felt like a primary school project to me. What practical use for something like this? 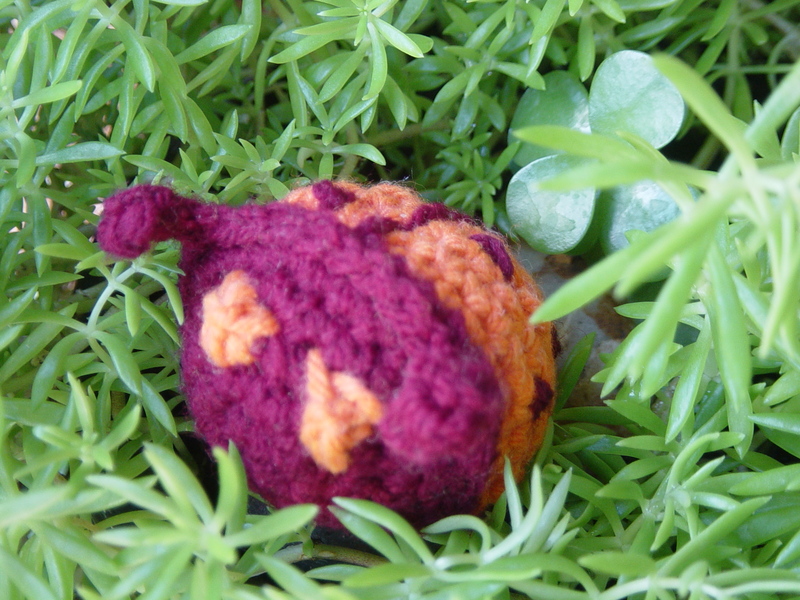 Either a pincushion or a little critter for the kid's guest room. On the other hand, if I made this one out of plarn and filled it will plastic, it could go in the garden. We do need a Lucky Ladybug charm for our garden, to eat up all the nasty bugs that the real ladybugs would normally eat, if our landlords hadn't poisoned them all away. So that's where I decided to take the foto, in our garden the next morning. I can sense all the nasty bugs quivering with fear at the prospect of a Ladybug moving in!